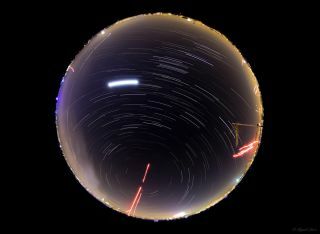 Astrophotographer Miguel Claro captured a 360-degree night sky image in Almada, Portugal, at midnight on Jan. 1, 2015. Streaks of artificial red light paint the New Year's Eve sky in a gorgeous image taken in the hour leading up to midnight on Jan. 1, 2015. Astrophotographer Miguel Claro captured this 360-degree view from the top of a building in Almada, Portugal. According to Claro, the city lights from Lisbon and Seixal, Portugal can also be seen around the rim of the circular image. Rising up from the ground are a few red streaks of light — these are "very lights" fired from flare guns in celebration of the new year. The image was taken with a Canon 6D (f/6.3 ISO 800 Exp. 10 Secs. 8mm Canon L circular fisheye). It is the sum of 474 images, with a total time integration of one hour and 20 minutes. Claro is an astrophotographer based in Portugal. His work has been featured in various magazines and websites worldwide. Many of Claro's amazing images have been featured on Space.com. You can see more amazing night sky photos by Space.com readers in our astrophotography archive. Editor's note: If you have an amazing night sky image you'd like to share for a possible story or image gallery, send photos and comments in to managing editor Tariq Malik at spacephotos@space.com.